On Saturday last, the eve of Summer Solstice, my son Luke and I headed out into the Boyne Valley in the hope of getting a photo of the triple conjunction of Venus, Jupiter and the Moon at Newgrange. Unfortunately after the sun set a bank of cloud rolled in, obscuring the triplet before we could get any decent photos. Not to waste an opportunity for a photograph (I rarely do! ), we headed to nearby Dowth, where I decided to play around with torches and flashes using my favourite stone-lighting technique – painting with light. You might have seen a previous post from the same night here. The stone above is famously known as the Stone of the Seven Suns. 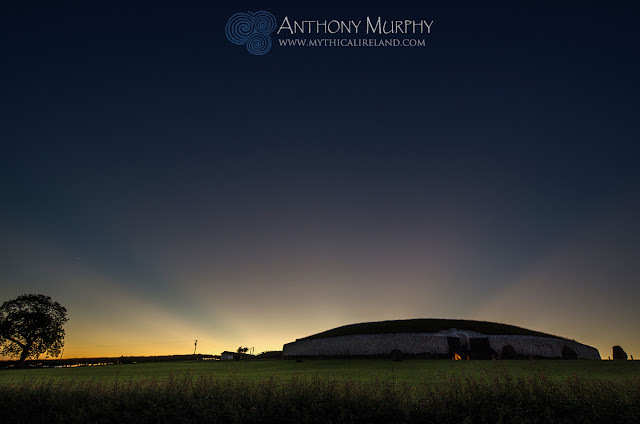 It was so named by Martin Brennan, an artist and writer who made several significant discoveries about ancient astronomical alignments in Ireland. There are several theories as to what this stone might mean. It is one of just a few stones that are completely exposed. Many of Dowth's 115 kerb stones still lie either partly or totally concealed beneath the earth and vegetation. I tried to use torchlight and flashlight to illuminate the stone from different angles to show as much of the art as possible. These carvings were made as long ago as 3,300BC and maybe even earlier. 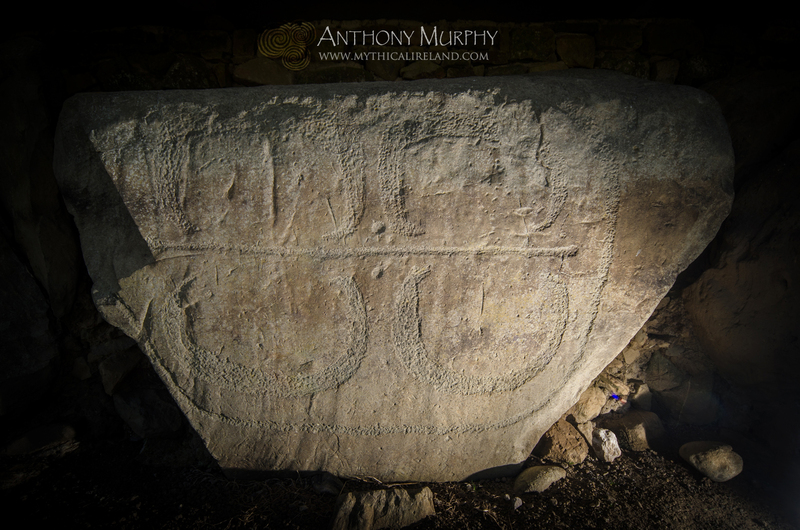 In certain lighting conditions, this stone can appear quite flat and the carvings don't stand out. The best time to see it is coming up to midday, with the sun lighting it from the side. Otherwise, a long exposure photograph with a light source from the side, or above, helps to show up the markings very well. Labels: Dowth, flash, kerb, painting with light, seven, stone, suns, torch. Tonight at Newgrange was very interesting. Having taken pictures of the sun setting behind Newgrange from Staleen, at the Boyne Canal, and then up on Red Mountain, I decided to head to the monument itself with my daughter Amy. We wanted to see if we could see the aurora borealis which had been forecast. On arrival at Newgrange, almost 45 minutes after sunset, we were greeted by the strange and wonderful sight above. There were huge beams being cast into the sky, as if the sun had just set. It might have resulted from some atmospheric scattering of sunlight related to the aurora. I don't remember ever seeing this effect so long after sunset. But it was magical. It only lasted a few minutes - but long enough for me to get some photos, of which the above is probably the best. I have brightened the photo up somewhat. You can see that the floodlight under the steps at the front of Newgrange is already on. This being the third of the three "standstill" days of Summer Solstice, the sun is at its lowest beneath the horizon for the whole year. Perhaps that had something to do with the above effect. I got some nice sunset photos from Staleen and Red Mountain, and then we stayed at Newgrange to watch Venus, Jupiter and the Moon and got some photos of those before heading home. I will post more photos tomorrow. The clouds looked ominous as I headed out from home towards the Boyne Valley. As I got closer to Staleen, on the southern banks of the Boyne opposite Newgrange, I could sense that something dramatic was about to happen in the sky. In my rush to get out there, I left my 18-105mm lens behind (at home) and only had my 12-24mm wide angle lens. I grabbed my camera and ran down the path along the Boyne canal. I was breathless when I got to the location from which the above photograph was taken. Within moments I was clicking away as the sun appeared below a great bank of dark cloud. For a few moments, it was spectacular. The sun lit up the whole underbelly of the cloud, creating a dramatic sky. It might have been raining - meaning that I had to wipe the lens pretty much after every shot - but it was perfect! The moment had finally arrived. Sunset on the longest day of the year had come. Orion carried the golden ball of light down into the earth. And it was beautiful. 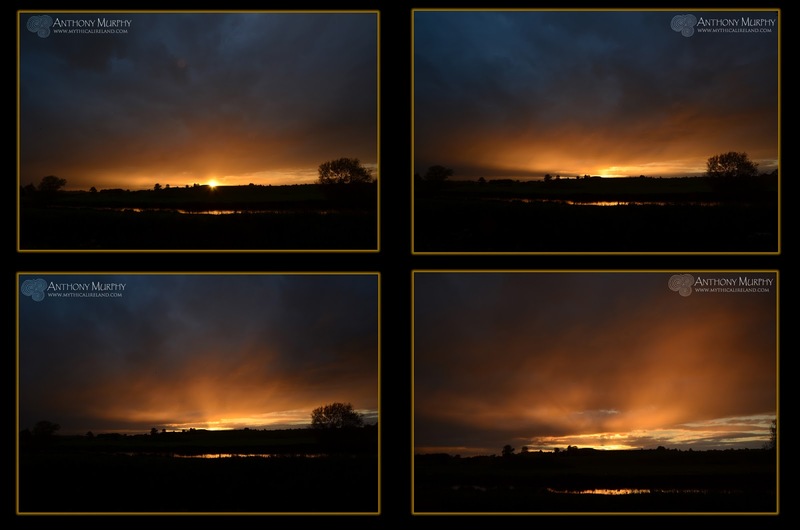 Below is a sequence of four unedited jpegs showing just how beautiful it was. Dowth kerbstone with circular carvings, illuminated from different angles to highlight the art. 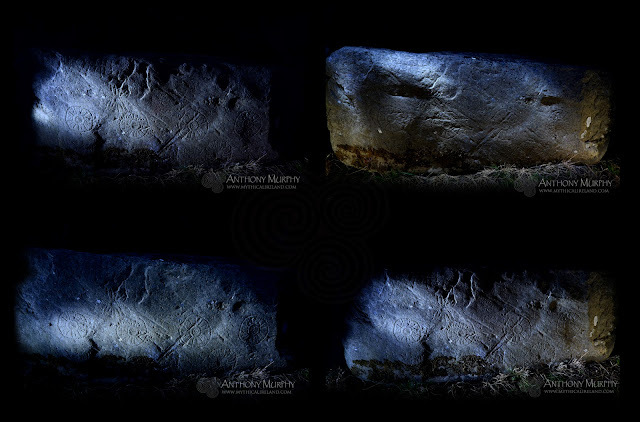 This is a montage of four different images of a kerbstone at Dowth that has a number of circular features carved onto its surface. I headed out with the camera tonight to try to get a photo of the triple conjunction of the Moon, Venus and Jupiter over Newgrange, but was disappointed when a bank of cloud rolled in before it got dark enough to get a nice shot. Not to waste the journey, I went from Newgrange to Dowth (my son Luke was with me for company) and we decided to try to light some of the kerbstones on the eastern side. This stone is located two stones to the right of the famous kerbstone 51, the Stone of the Seven Suns. It is better exposed now than in any of my previous visits over the years. Some work has been done in recent time to clear away the grass around these kerbstones, which are fenced off to keep livestock away. Regrettably, whoever carried out the work also cut down a lone bush which had grown over kerbstone 51 a couple of years back. To try to highlight the four circular features apparent on this stone, I tried to light it from different angles using a technique which I have been fond of for 16 years now which is familiar to photographers as "painting with light". What do these arcane circles represent? We could make many guesses. Given that Dowth's mythology as well as its design are likely connected to the study of eclipses, we could speculate that these are perhaps representative of full moons. Cosmic imagery is plentiful on the monuments of the Boyne Valley, where a community of farmers and astronomers built huge stone structures aligned on cosmic events over 5,000 years ago. 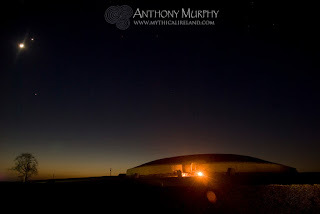 While we did not see the triple conjunction in all its glory, we did get a glimpse at the three planets hanging in the evening sky over Newgrange just before the cloud obscured them, and wondered what our ancient ancestors would have made of such a sight all those millennia ago. Fittingly, as Dowth's Irish name, Dubhadh, means "darkness", it became pretty much completely overcast as we photographed its stones . . .
See also this new video explaining some of the astronomy and mythology behind this event. The longest days of the year have arrived. The sun's rising and setting positions have reached their most northerly points along the horizon and these rising points are now "standing still" - hence the word solstice, or in Irish grianstad, meaning, literally, "stopped sun". Orion "carries" the sun across the sky on the three longest days of the year. The further north you are located from the equator, the longer the days in summer, and the shorter in winter. 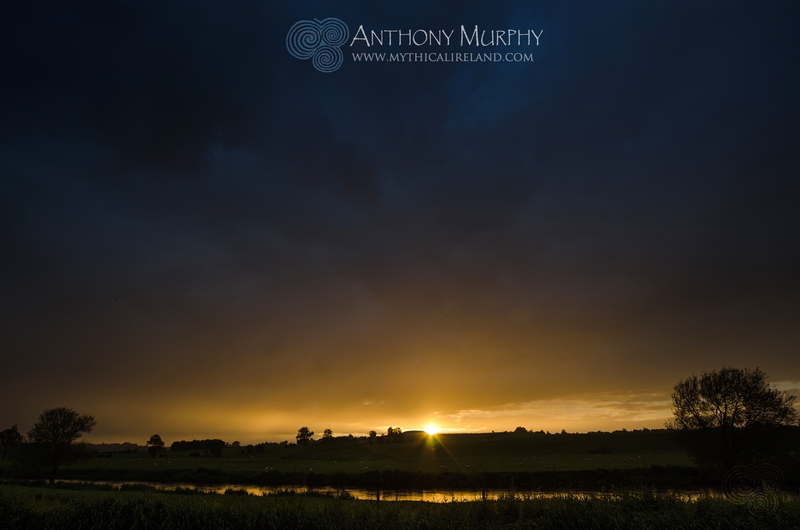 Here in Ireland, in the Boyne Valley, the sun rises before 5am on Summer Solstice and sets around 10pm. Even in the middle of the night, there is no real darkness as the whole northern horizon remains bathed in light. This is a result of the fact that the sun does not go far enough below the horizon at midsummer for Astronomical Twilight to end. The sun is crossing over the Milky Way right now. Something else that's really interesting is happening right now as the sun crosses the sky on these, the longest days. If you could somehow darken the sun, like what happens in a total eclipse, you'd see that the sun is currently positioned directly above Orion. In fact, at Summer Solstice in this modern epoch, the sun appears to be "carried" across the sky by this great anthropomorphic warrior/god/hunter constellation, in his upraised arm. Further to this is the fact that the sun is currently located in one of the two positions where it appears to "cross" over the Milky Way. Astronomers today call the sun's path the ecliptic. This imaginary ring through the sky intersects the Milky Way in two places - one above Orion and the other beneath Ophiuchus, between Sagittarius and Scorpius. It just so happens that in our lifetime, these positions correspond with the location of the Summer Solstice and Winter Solstice sun, respectively. It is fascinating that the Boyne river, along which the greatest megalithic passage-tombs in Europe were built, has a name that is the same as the old Irish name for the Milky Way - Bealach na Bó Finne, the Way of the White Cow. 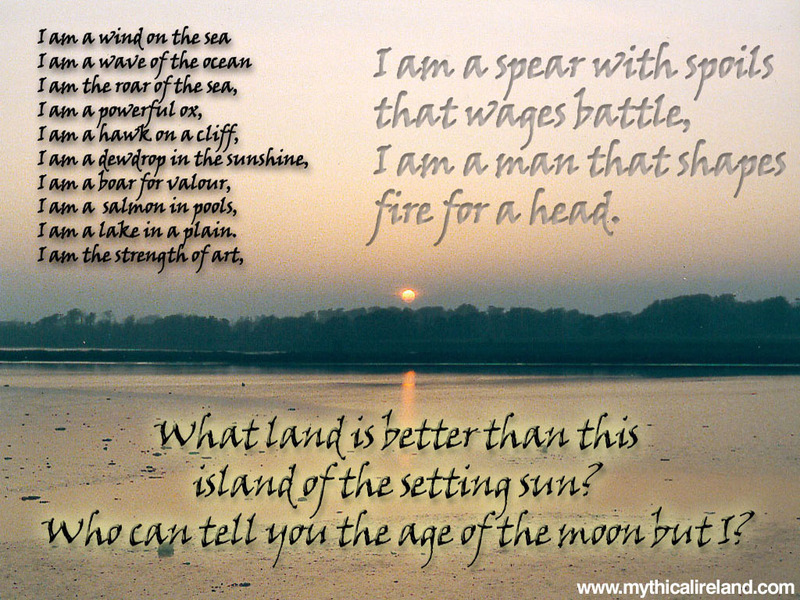 In mythology, there are many gods and warriors, but some particularly interesting ones which we examined in Island of the Setting Sun - In Search of Ireland's Ancient Astronomers. One of these is Lugh Lamhfada, Lugh of the Long Arm (or the long throw, perhaps). In the ancient mind, was it perhaps Lugh who was seen to "throw" the sun, moon and planets from his upraised hand? arrived in Ireland with the Milesians. There are other characters of mythology that are interesting. Amergin, leader of the Milesians, was known as Amergin of the Bright Knee. The star that we know today as Rigel has an Arabic name which means "bright knee". 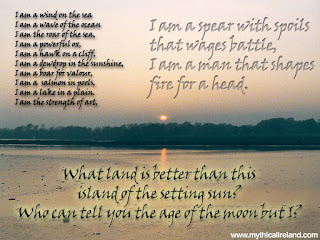 Amergin asked "who but I knows the place where the sun sets, who but I knows the ages of the moon?" The Annals of the Four Masters says the Milesians arrived in Ireland at Bealtaine in 1694 BC. 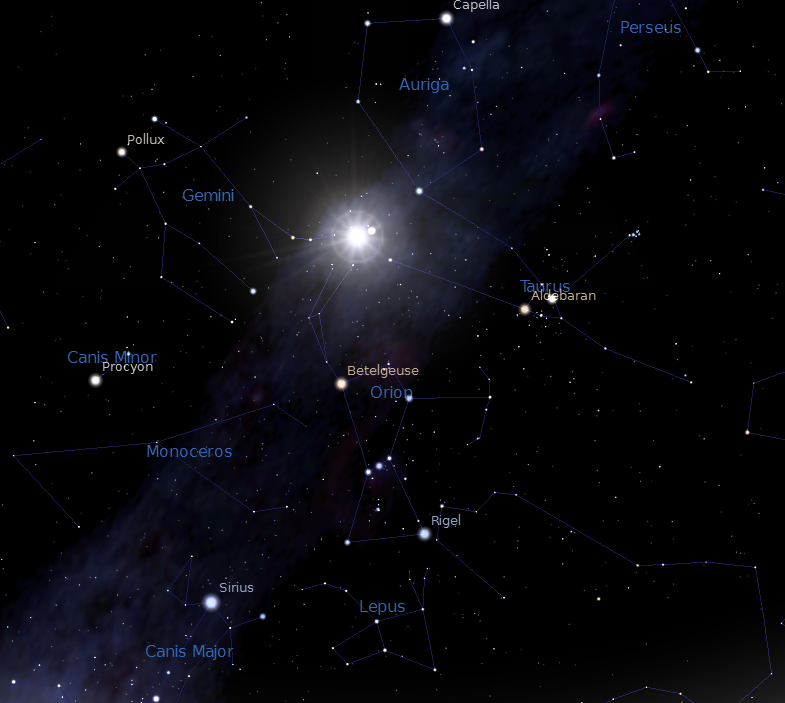 On that date, the sun was above Orion, being carried across the sky. Because of an effect of the wobble of the earth's axis called Precession of the Equinoxes, the sun's position on the ecliptic on a specific day of the year (eg solstices, equinoxes) is slowly moving westwards through the ecliptic. 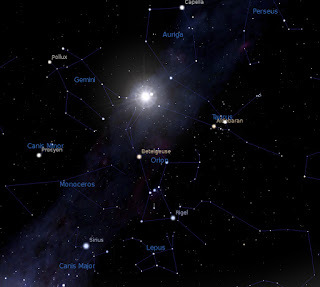 When the Milesians arrived in 1694BC, their bright-kneed leader set foot on the shore of the Boyne river at the moment the sun was being carried by the constellation Orion - that might have been known then as Amergin. Nowadays, the sun's position at Bealtaine has moved so that it is beneath Aries. 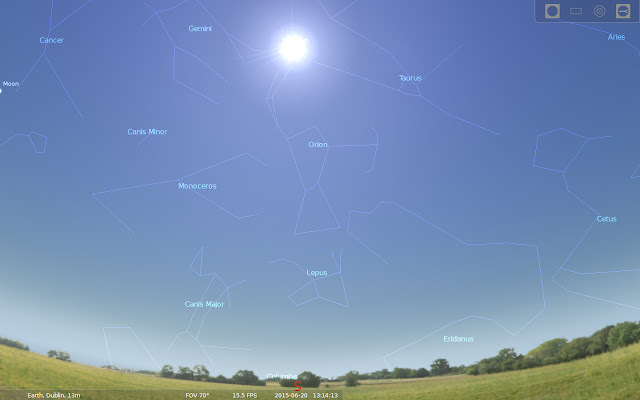 It is on Summer Solstice now that Orion/Amergin/Lugh appears to carry the sun across the sky. And then there's Cúchulainn, the warrior hero of The Táin Bó Cuailnge, who battles in ford water - a ford being the crossing point of a river. 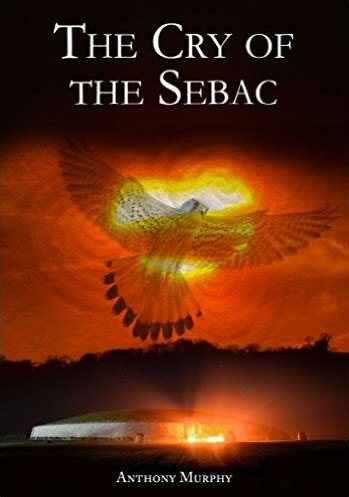 Was he guarding the ford of the sky, as hinted in The Táin? in the starlit ford of night. It is no mere coincidence that Cúchulainn is a son of Lugh. The Milky Way was known as Lugh's Chain and Lugh used a weapon called the Tathlum, which is described as a concrete ball - made of his enemies' brains hardened with lime. Could this be the moon? From his hand he threw the tathlum. Today, as you watch the sun make its way across the sky on the weekend of the Summer Solstice, it would be nice to reflect upon the powerful imagery. The god of light has the sun in his hand. This is kerbstone 83 at Knowth – or, if you prefer Martin Brennan's numbering system (which I don't), kerbstone NW9. 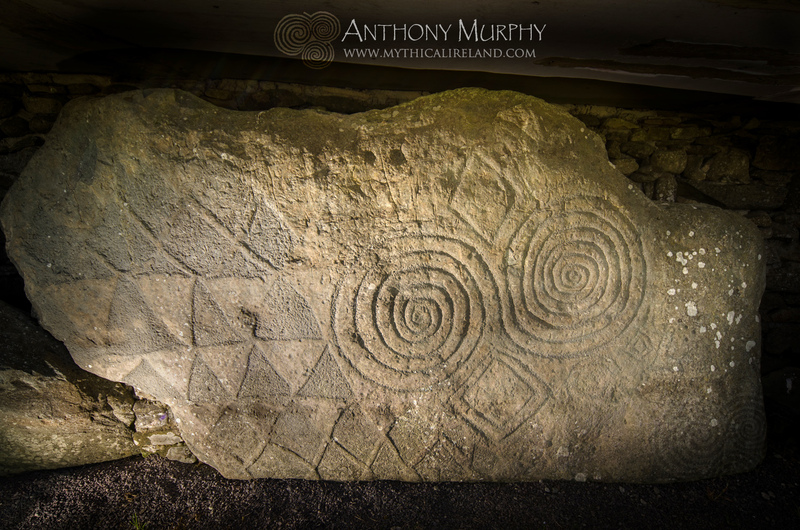 Professor George Eogan, who excavated Knowth, refers to the style of art on this stone as the "lavish style". He does not offer any further insights into what the carvings might mean. Who can blame him? Brennan suggests the mixture of natural holes and cupmarks "seem to provide a starry background" to lunar imagery. This is indeed a peculiar stone. It's got a series of natural holes and linear markings (maybe a geologist can tell us what they might be called) and engravings that are mostly crescents, with some concentric circles centred around what might be a natural solution hole. There's also a spiral and a wavy line. A very long linear marking across the middle of the stone appears to connect a series of crescents on the far left with a "wavy line" as Brennan calls it, on the right. Curiously, a series of five natural holes (at least they look natural and not man-made) between the spiral and the wavy line appear to be enclosed within a cartouche. One wonders why. The stone is unique in having such a conglomeration of natural features and man-made designs. Neolithic passage-tomb construction - mutual cooperation or enforced labour? I'm reading a fantastic book about ancient Ireland right now, written by an archaeologist. It's called 'The Origins of the Irish' by J.P. Mallory of Queens University and it's one of the best books about prehistoric Ireland that I've ever read. Admittedly it's not exclusively about prehistory, and admittedly I'm not finished reading it yet! But on almost every page Mallory is presenting interesting data and posing even more interesting questions. And so we arrive at page 77, and one of the major questions about the passage-tomb builders is given consideration. The giant passage-tomb of Knowth and one of its satellites. Huge effort was required to build these monuments. SURPLUS, WEALTH and SOCIAL RANKING. And so, as we sowed the seeds of agriculture in the Boyne Valley and other parts of Ireland, introducing a new way of life to the island, we also sowed the seeds of a modern civilisation that, despite all its benefits, has seen us painfully divorced from cosmos and the natural world, such that we're trying to kill our planet – by overpopulating it, by stripping it bare, by choking it and by many other means, insidious and foul. But that's not the main point of this blog post – even if it is a most pressing matter pertaining to our very existence right now. The point (or rather the question), in terms of the whole idea of social ranking and wealth and "discontent", is this: were the monuments built by a community of people that was unified in its beliefs, and content to contribute to this mammoth effort to enshrine its beliefs, and perhaps immortalise its "moment in time" monumentally in stone? Or, as the result of a hierarchy – a system of social ranking – was that community coerced, compelled or otherwise forced into these monumental labours against its wishes? I'd like to tell you that Mallory gives us a definitive answer to that question. But, despite his obvious brilliance, he does not have enough evidence to place himself on either side of the fence (let's call it a Neolithic palisade) that divides these two options. There might, of course, be a third option – it's possible that some people did it because they wanted to and some were coerced, compelled or otherwise forced. ... while mutual cooperation is always possible, large labour projects have often been seen to indicate the emergence of some form of social elite. Personally, I've always leaned towards the "we're all in this together" idea – and see in the monuments of the Boyne a collective and cohesive effort representing the endeavours of a community that was largely working as one. What is my evidence for this supposition? I'm not sure that I could give you anything concrete. I see monuments large and small, apparently built to a system based on alignments and on cosmology, representing an effort to record and understand the passing of time, and cycles, but also representing a spirituality, whose complete depth and complexity we might never understand. It doesn't "feel" like a project that was undertaken or completed under duress. But that's just a hunch. What material evidence would there be, if there had been an elite, and they had compelled the population to haul the giant stones up the banks from the Boyne, and to sail to Cooley and Wicklow and perhaps other areas in search of materials? How would we know one way or the other? I don't have an answer to this question. Perhaps some of the archaeologists do. 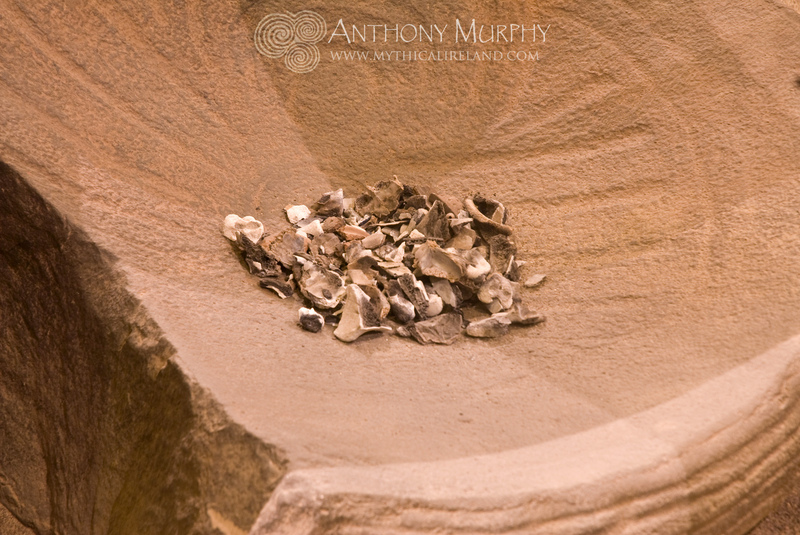 Bone fragments in a basin at Knowth (reconstruction). Apart from some complete hand and foot bones, all human specimens consisted of small fragments. It's been virtually impossible to tell how many people were interred in the chambers of some of our most famous tombs. At Newgrange, there are fragments from five individuals - but that's all that can be said. Maybe the fragments are from many more individuals? At Knowth's eastern chamber, there were fragments found representing something between 150 and 200 individuals. Were these all the remains of cherished members of that community of mound builders and astronomers and farmers, lovingly brought to the interiors of the monuments following some ancient ritual of disintegration? Or might some of these bone fragments represent something more sinister – such as ritualistic sacrifice or even cannibalism? In my own research, I have reached tentative personal conclusions, but it's always healthy to consider other options and possibilities. We are a long way from a full understanding of the people of the Neolithic – such a thing is scarcely possible unless we find a way to travel back in time. All we can do is look at what's there and try to figure it out as much as possible. The truth is that we can scarcely understand ourselves, and our own incongruous and destructive aspects that push us towards the brink of self-annihilation. I like to think that we can learn something about ourselves by looking into the past. 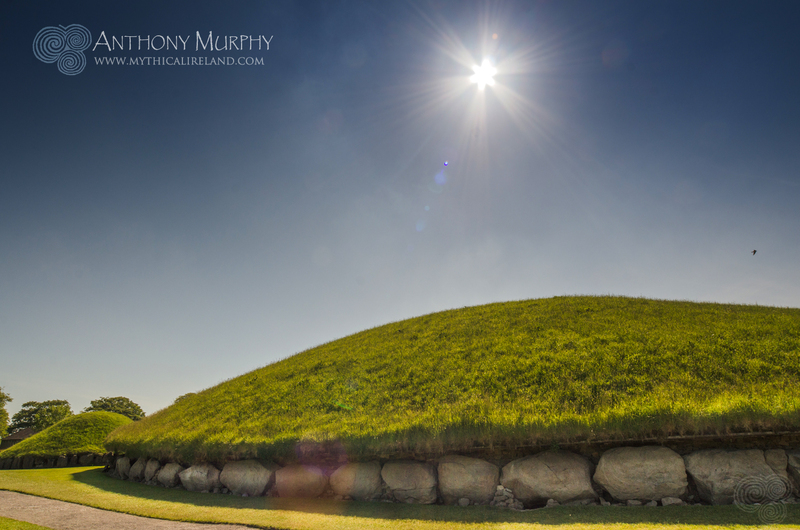 It's possible that Newgrange can teach us enough about ourselves so that we can learn to change for the better . . .
* At least not in the books I've read about the archaeology of the Neolithic/Boyne Valley. But there may well be some solid archaeological research into this area that I'm not aware of. Labels: bones, community, farming, fragments, Neolithic, Newgrange, passage-tomb, society, structure. This is kerbstone number 67 at Newgrange. It is one of only three highly-decorated stones - there are 99 kerbs in total. This is in stark contrast to Knowth, where there are many very ornately decorated slabs in a kerb of 127 stones. Most of the kerbs at Newgrange are composed of a stone called greywacke (also called green grit) and were sourced, according to archaeologists and geologists, at Clogherhead on the Co. Louth coast, some 20km journey by river and sea. PS: The triple spiral partly visible on the very bottom right of the stone is a copyright watermark added to the image by me! The interpretation of megalithic art is a highly subjective area. 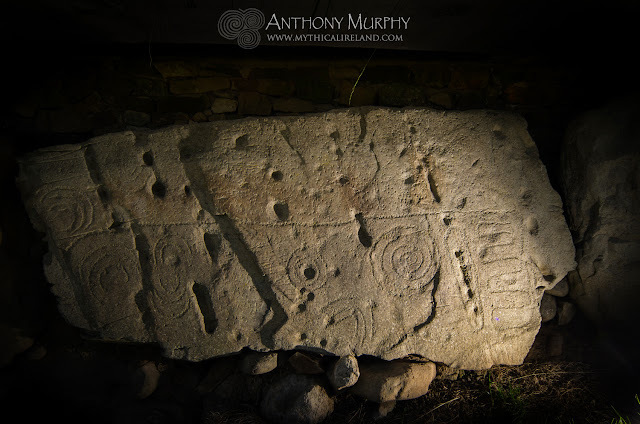 I have a tendency to go along with some, but not all, of Martin Brennan's interpretations, and am particularly impressed with his interpretation of what he calls the Calendar Stone. This does not mean I am an absolute convert to the notion that all of the Neolithic symbolism carved on stones in the Boyne Valley is cosmic or astronomical in nature. I like to observe and to admire the art, and in some cases to interpret it in the context of astronomy. But what works for the interpretation of one stone does not necessarily transfer to other stones. There's so much art - particularly at Knowth, where one is constantly impressed by the sheer amount of petroglyphs that one wonders how many different people were responsible, and over what span of time. I've been going there for years, and I still stand in awe at this massive megalithic art gallery, grafted carefully and lovingly all those millennia ago. The above kerbstone is kerb number 86 (according to Professor George Eogan's numbering convention, which we'll use for convenience). It is located on the western side of the kerb, a short distance north of the dramatic and cryptic entrance to the western passage. So what do I see? Do I see the C? The opposed Cs, as George called them? Well, kind of. But I don't think like an archaeologist. So I dislike the simplicity and arbitrary nature of labels like "opposed Cs". I don't think the people who carved them thought of it that way at all. So what do I see? Do I see what I want to see? Perhaps. I might see the arc of heaven. I might see the Milky Way, in all its glory, stretched in a spectacular arch across the ceiling of night, in the beautiful ancient Boyne Valley under the darkest of skies, unpolluted by the choking fumes of modern industry and transport, and unhindered by the artificial light with which we so alienate ourselves from the cosmos today. And I might see this milky road of the stars, this bright way of the heavens, reflected on earth by the Boyne river, which loops magnificently around the great monuments of Brú na Bóinne. Did the ancients think this way? Did they think cosmically? Did the monuments somehow proclaim their tiny place of presence and permanence in a vast cosmos? In olden times, the Irish for the Milky Way was Bealach/Bóthar na Bó Finne - the Way/Road of the White Cow. The Boyne river is from Bóinn - Bó Finne - the river of the White Cow. The names of the river on earth and the 'river' in the sky had a similar derivation. 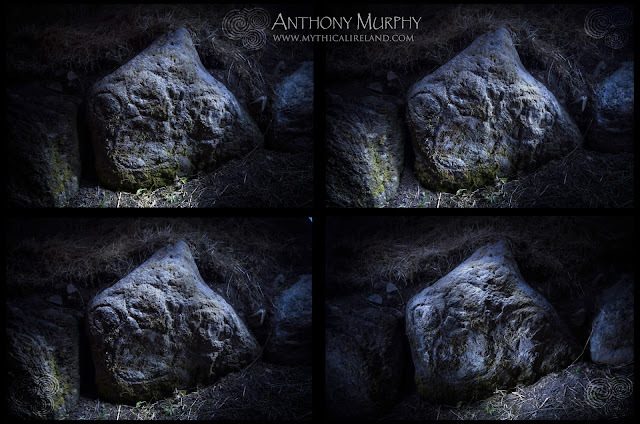 Do these carvings on kerbstone 86 at Knowth represent the idea of Heaven's Mirror - As Above, So Below? Is the sky reflected on the ground? Is the line in the middle representative of the demarcation, the liminal boundary between heaven and earth? All of the symbols are enclosed in a sort-of great cartouche, perhaps an indication of the cosmos as an entity with limits - something that ends where the stars are fixed, where the souls go after we gently place their remains in the stone chambers, perhaps? Underworld, overworld. This world, the otherworld. Earth, heaven. Ground, sky. Conscious realm, subconscious realm. Reality, fantasy. Fact, theory. Objective, subjective. Tourist, tour guide. Tomb, womb. Decoration, language. 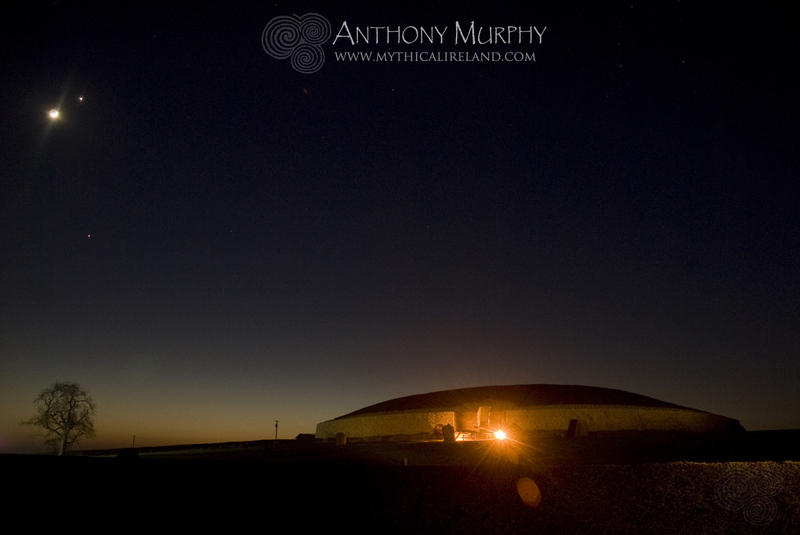 Several years ago I wrote about the Cygnus Enigma and the apparent orientation of Newgrange towards Fourknocks and the orientation of Fourknocks towards a place on the horizon where the brightest star of the swan constellation (Cygnus) would have been rising after its brief glance with the horizon towards the north. Recently I've been looking at this alignment system in more detail, and that study has yielded more interesting results and fascinating possibilities. I will summarise what's been written already, before going into new detail. In a nutshell, Newgrange points towards Fourknocks, although neither site is visible from the other. Fourknocks lies about 15km (approx. 9 miles) to the southeast of Newgrange. There are two intervening hills that block the intervisibility of the sites - Red Mountain and Bellewstown. 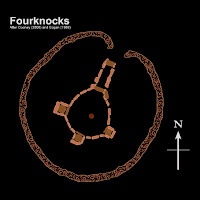 Fourknocks lies at approximately 137.95 degrees of azimuth from Newgrange, according to Google Earth. This would place it on the edge of the range of azimuths covered by the Newgrange solstice alignment, which, according to Patrick (1974) were 133° 42' to 138° 24', while Ray (1989) says the range is 133° 49' to 137° 29'. The best way to try to visualise this is that as the sunlight is retreating from the chamber of Newgrange at solstice, the sun is directly above Fourknocks. 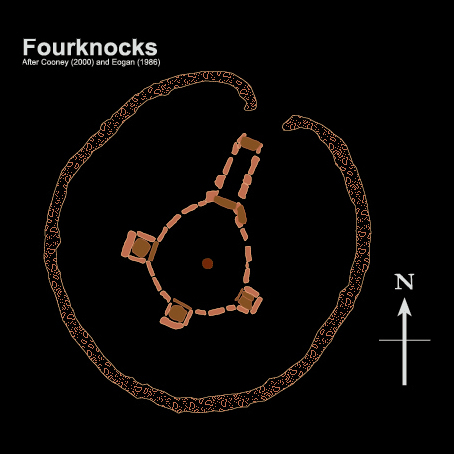 Fourknocks, in turn, has a passage that is aligned to approximately 14° azimuth, in the far northeast. Richard Moore and I had suggested that Fourknocks is aligned in the direction of the Baltray standing stones on the northern side of the Boyne Estuary (Island of the Setting Sun, 2006) and that the two stones lined up to point back towards Fourknocks, even though neither site was visible from the other. It is this alignment – the axis of the Fourknocks alignment – that has yielded fascinating new information. Sitting on the sill stone of the rear recess of the Fourknocks chamber, looking out through the passageway to the far horizon, one is looking at a hill towards the north-northeast called Mullaghteelin. Near the summit of Mullaghteelin, directly on the alignment as viewed from Fourknocks, is a barrow (ME027-034----), probably dating to the Bronze Age. 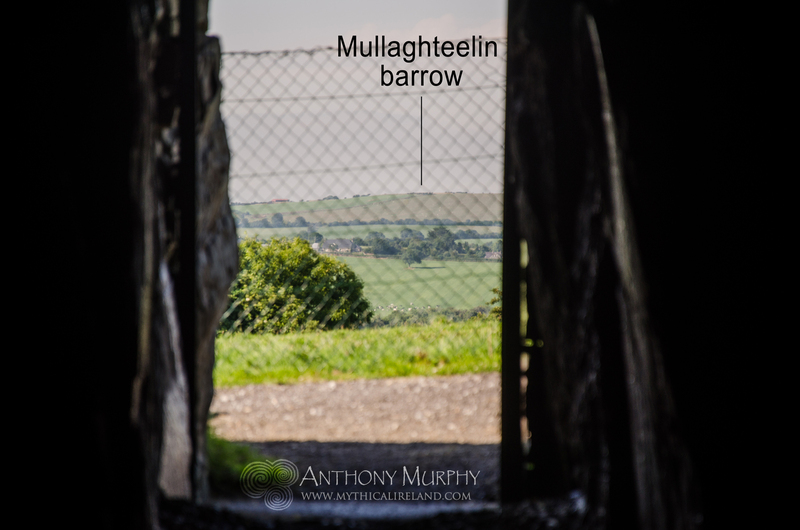 The photograph on right shows the view out through the passage, with Mullaghteelin barrow indicated on the horizon. The two stones are circled in red - the larger stone has a bigger circle around it. We didn't have this wonderful program when we wrote Island of the Setting Sun in 2006, but it's wonderful to see how accurate the alignment really is. Whether this alignment was created intentionally is an entirely different matter, but one wonders, given the existence of several long-distance alignments of ancient monuments, if indeed the ancients had skills beyond which we give them credit for. Here's where it gets really interesting. If you continue the line from Fourknocks beyond Baltray standing stones, you will find that it eventually hits the shoreline on the Irish Sea coast at Clogherhead. It then travels across Dundalk Bay and eventually meets the shoreline of a stony beach on the southern shore of the Cooley peninsula at Rathcor/Templetown. Both of these shores – Clogherhead and Rathcor/Templetown – were locations where stone for Newgrange was sourced. Clogherhead (above) was the source of the greywacke slabs that were used as kerbstones, passage orthostats and large structural stones in the chamber of Newgrange. An estimated 200 of these rocks, weighing on average three tonnes apiece, were brought from the shoreline at Clogherhead by boat down along the Irish Sea and up the river Boyne to Brú na Bóinne. For more about the transportation of these greywacke slabs, see Newgrange - Monument to Immortality. 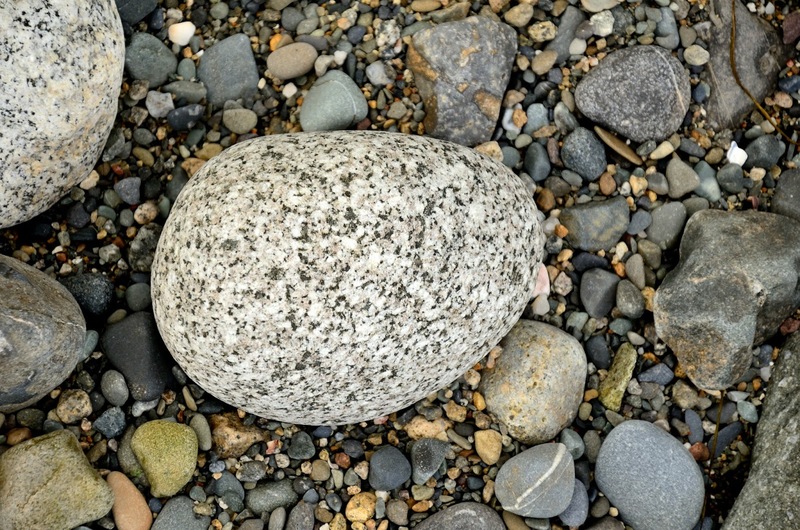 Rathcor and Templetown beaches are littered with rocks of all different types and sizes. Most interesting of these are the granite cobbles which, it is said, were brought from this area to Newgrange to be placed among the white quartz stones that decorate the front of the monument. Again, these would have been transported by sea, across Dundalk Bay, around Clogherhead and then up the Boyne. So, whether by accident or design, the Fourknocks passage points towards two of the three locations from which it is said that stone was sourced for the construction of Newgrange. Just for the sake of it, I looked at the alignment in the opposite direction, south-southwest from Fourknocks. Interestingly, it points towards the Blessington Lakes in Co. Wicklow, some 30 miles or 50 kilometres distant approximately. Now this really is a stretch of the imagination, I'll readily admit, but we've all been told that Wicklow is the likely source of the milky quartz at Newgrange, although the exact location or quarry from which it was extracted has never been found. I've heard it suggested that Blessington is a possible source. It could have been transported from that area by barge down the Liffey River into the Irish Sea and from there up to the Boyne. If the Blessington area turned out to be the source of the Newgrange quartz (and it's by no means anything other than a possibility at this point in time), then the Fourknocks alignment would "point to" all of the major sources of stone for the construction of Newgrange - the greywacke from Clogherhead, the granite cobbles from Cooley and the quartz stones from Wicklow. As it stands, we can say that Fourknocks definitely does point to two areas from which stone was sourced. The third remains an unknown, but Blessington is a possibility. More recently, Rockabill islands off the coast of Dublin have been suggested as a possible source of the milky quartz at Newgrange. This is equally interesting, because the larger of the two standing stones at Baltray points towards Rockabill for winter solstice sunrise. Just to finish, the Fourknocks alignment also points to a peak called Eagle Mountain in the Mourne Mountains in the far distance, which are easily visible from Fourknocks on a clear day. I'm not sure if there's any particular significance to this peak to tie in with the alignment. Geologists have told us that the cobble stones from Rathcor/Templetown have their origin in the Mournes. It has recently been revealed that an x-ray study of the granite cobbles of Newgrange is to be undertaken to ascertain their precise original source. Read more here.